When first listening to Gil Kuno’s lecture, I couldn’t understand his progression from a video on the fourth dimension to his own projects, but as I explore his website I begin to realize what he is attempting through his work. In the first video in Gil Kuno’s lecture we begin at a picnic with two individuals, slowly our view of the two picnic goer becomes less and less as the camera pans away. Quickly we leave the Earth’s atmosphere and travel through our galaxy and even more quickly we leave the outermost planets of Uranus and Neptune, lost in a sea of space. In addition, the first video I mentioned, which explained dimensions past the third, another insight into the potential complexity space and time.I have to admit that after a marathon of the History Channels, “The Universe”, I have come to understand space in a much more scientific way, beyond the artistic interpretations of Gil Kuno and the video on dimensions. When observing the night sky, one cannot help but pause and observe the shiniest and closest object - the Moon. Some theories assert that once the moon was a part of the Earth itself and that collisions with comets and asteroids have chipped some of the material from the Earth. This material, due to gravity later formed the Moon. Ever since it was formed, the Moon has been slowly escaping Earth’s gravitational pull, and it is now much further away than it was twenty thousand years ago. Eventually, the moon will wonder away from Earth’s gravitational field into the unknown, ever expanding universe. The Moon is not the only sky object that keeps moving away from the Earth. In fact, every single object in the universe is moving away not only from the Earth, but also from any other object in the universe. The truth is that the universe is governed by ever-lasting set of rules, which are abided by, by both matter and energy. These two entities in which the entire universe is made of, leads me to argue that simply stating that what some might perceive as chaos, is actually an unwillingness to understand the admirable nature of the universe. The fact that the universe is expanding in time means that, at some point, the universe was at singularity, infinitely small in dimensions. 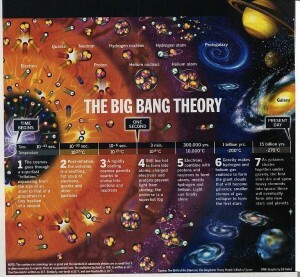 This also means that the Big Bang was anything but big, and it couldn’t have been a bang, as there was no air or any other medium to transfer the impact waves from the bang. Assuming that an explosion occurred implies the existence of a bigger, outer space within which our universe exists. Because our universe is expanding, will it ever reach the outer limits of that outer space, or is this “bigger universe” expanding as well? 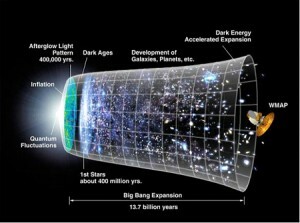 Is this the only universe in existence? Some questions will remain unanswered for quite some time, and we are running out of time to answer many of them, as the universe is expanding proportionally with the distance from the reference point. This means there is a point beyond which the universe expands at the rate faster than the speed of light, which implies that there is a horizon of visible universe,and any light originating beyond it will never reach us. Thus, even though we are armed with vast knowledge and intelligence to grasp the rules of the universe, some questions will inevitably remain unanswered until the end of time. This entry was posted on Saturday, February 28th, 2009 at 11:42 pm	and is filed under week 8. You can follow any responses to this entry through the RSS 2.0 feed. Both comments and pings are currently closed.